Fall Bucket List + $59 Plaid Dress! Happy Thursday! I'm changing things up and posting on a Thursday instead of a Wednesday; to be perfectly honest I'm making this change to see if my Monday posts get more eyeballs on them! So for a few weeks I'll be posting Mon and Thurs to see if there's a difference and if there is, this will become a permanent change. Also, I finished my October editorial calendar the other day (probably later than most bloggers... oh well lol) and I'm really exited for the new content! This month I'm aiming to include more beauty posts as well as a couple of apartment posts. Today, though, I wanted to share TWO things with you all. First, an adorable plaid dress under $60 and secondly a fall bucket list I put together! Okay, so this dress is technically listed as a tunic on Nordstrom's website BUT I'm 5'4" wearing an XSmall and it hits right above my knees. You can kind of see in the picture the length and roominess so I highly recommend sizing down! Also, it is so cozy and soft, I can't wait to wear it with over the knee boots when it gets chillier. Now let's talk the fall bucket list! How cute is this graphic Kyle helped me make!? Okay I shouldn't use the word "help" because I sent him a list of criteria and he did everything. That's another thing I want to start including more into my blog posts is graphics (hint hint Kyle...)! 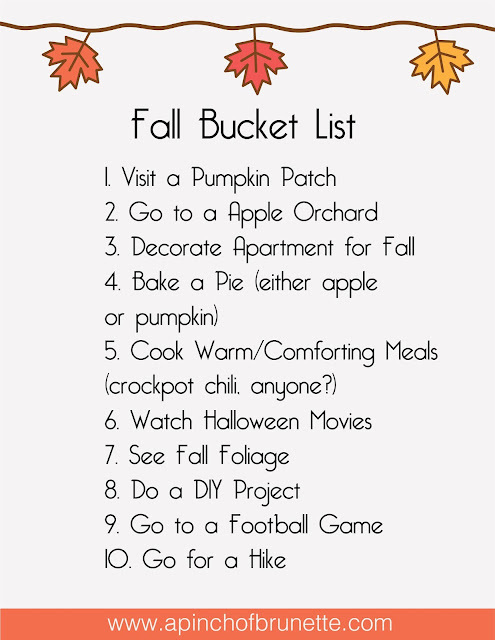 On the bucket list is 10 things that I want to do this fall. Now I'm not sure if all 10 will happen but I'm going to try my hardest! For instance, I have no idea what I mean by "DIY project" I just thought doing one sounded fun and I have no idea where to go apple picking in LA. That being said, I think this bucket list is a fun way to get yourself to do things you might not normally do or you forget to do! Enough rambling for today, I wrote way more than I meant to but let me know in the comments or on Instagram if you cross any of these activities of the list!